No snowflakes blue and brown stamping | Light Your Nails! Today I am showing you a nail art fail. I love brown with blue so while I had L’Oreal Mysterious Icon on my nails I decided to pick BornPrettyStore's Light Blue (no. 9) stamping polish and play with it. What could I do with a light blue shade? Snowflakes! 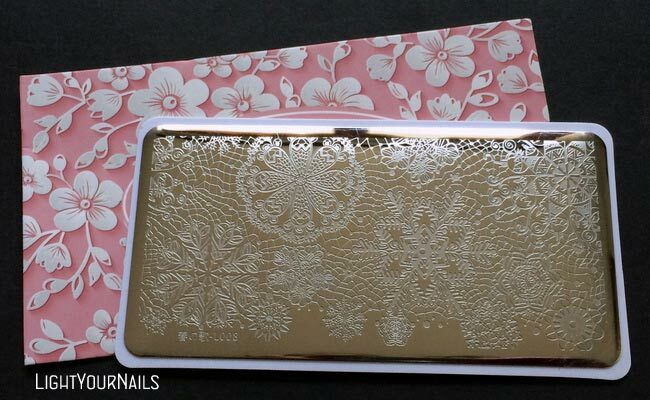 My new BornPretty/Nurbesten’s Harunouta L008 stamping plate* looked like the perfect choice. Problem is the patterns on this plate are really large and on my nails you can’t really see it’s snowflakes. You can see some laces and some non-identified design. I was so sad about it because this stamping plate is really pretty and works wonderfully. I can’t understand how to use it at its best so that it does show that it’s snowflakes. Because I was so unhappy with my mani I top coated it with China Glaze Golden Enchantment. At least there’s holo! Oggi vi mostro la nail art fallimento che ho tentato di realizzare con lo smalto L’Oreal Mysterious Icon come base. Mi piace molto l’accostamento marrone-azzurro quindi per prima cosa ho scelto lo smalto da stampa: il Light Blue n. 9 di BornPrettyStore. E cosa fare con l’azzurro? Perchè non dei fiocchi di neve?! Benissimo, ho preso il dischetto Harunouta L008*, sempre di BornPrettyStore/Nurbesten. Il problema è che le immagini su questo dischetto sono molto grandi, e sulle unghie non si vede affatto che si tratta di fiocchi di neve. E’ venuto fuori un po’ di pizzo e un po’ di roba non ben identificata. Devo dire che mi dispiace un sacco perchè il dischetto è molto bello e funziona benissimo, però non riesco a capire come usarlo/posizionarlo per rendere la stampa al meglio. 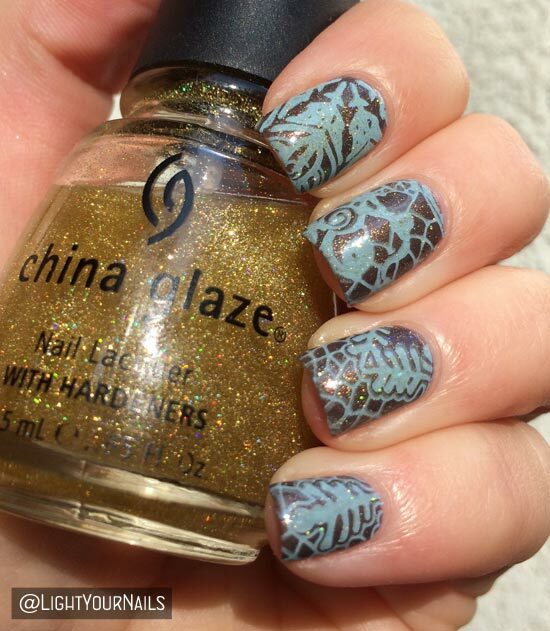 Data la poca convizione ho aggiunto un tocco olografico con China Glaze Golden Enchantment. Do you have any suggestion on how to use this stamping plate at its best? I’d really love to have any help so I can use it again for some holiday mani! Avete qualche suggerimento da darmi per usare questo dischetto meglio? Vorrei veramente aiuto per poterlo sfruttare! Quella sull'anulare piace anche a me, invece il mignolo mi sembra il corno di una renna! I saw this plate and thought it looked gorgeous but couldn't figure out how to actually stamp so it looked like snowflakes on your nails. I think it is just a design flaw in the plate. The designer really should have made tiny snowflakes connecting in the details for the larger one so at least you could get them that way. It's still great stamping on your end though! Thank you Jen! You are probably right, there's no way to actually get any snowflakes showing as they are all way too big. Love the color combination you chose. The stamping is beautiful. In effetti è dura vederci dei fiocchi di neve... ma in fondo chi se ne frega no? La manicure è comunque molto carina! Oh what a unique combination. I love when people go outside the red/green box. I don't stamp so I can't really give you any pointers. Sorry! it looks awesome, I just wish there were smaller snowflakes. I agree that blue and brown are a wonderful color combo. As for the plate, maybe you could make decals or try double stamping the snowflakes over the leaves? I might have to try! 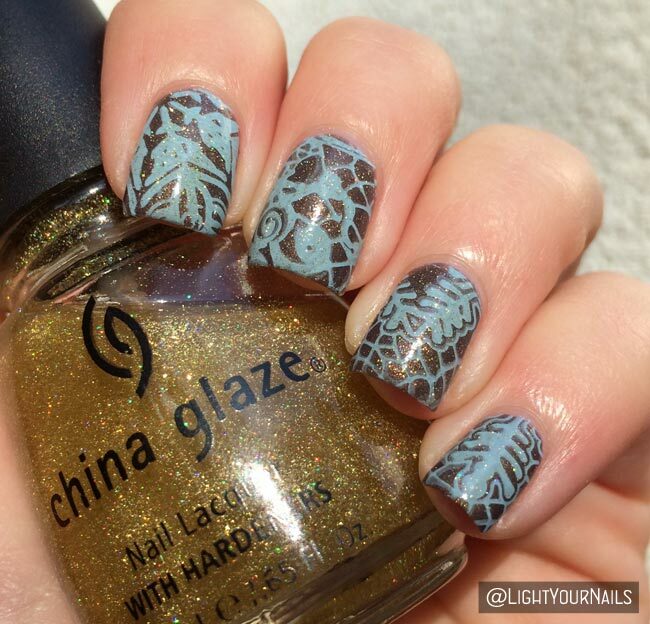 The design and colors are so pretty, your mani looks stunning! I love the final look of your stamping, but you could try the minimizing technique with your stamper! Great idda! Braves Diva Nails just did a great tutorial on this in YT if anyone is interested! I tried that once and I didn't get it right. I definitely have to try again! I seriously love the stamping. It looks like lace until you get close to it and see how wintry it is. Awesome job! I actually still like the design even if it didn't come out how it was supposed to! I just got this plate too and I agree, the plate is more gorgeous than the stamping you can do with it. That said, I think it works well to use the edge parts of the snowflake (maybe like you did on your ring finger and pinkie?) to have partial snowflakes on your nails. And, even if it doesn't look the way you'd hoped, I think this is a lovely nail art! I think that snowflake part I've used looks like a reindeer's horn though!! I agree with the other commenter that said that it seems to be a flaw in the design...it doesn't seem very well thought out. That said, your mani is beautiful! Did you try using the smaller snowflakes that are along the bottom of the design? Or is that what you used? If so, sorry. It's hard for me to judge the size of them! If so, then my only other suggestion would be to use it as a background design for some double stamping. Sorry I'm not more help...I am just getting into stamping so although I'm totally obsessed, I'm not very experienced. Again,I think you did a beautiful job. I may have to try this color combo! Thank you Lindsey! Can you believe I didn't notice the smaller snowflakes around the border until I read your comment? ?